The Baileys celebrate his brother's marriage in a family reunion at the Bailey house that evening. After a family photograph is taken outside the Bailey home, everyone moves inside except George and Uncle Billy. When Uncle Billy staggers down the street, George is left alone outside. He looks back through the porch screen door, noticing his mother, Harry, and Ruth getting acquainted. Having a smoke while he paces around the walk a bit, George hears the distant sound of a departing train whistle and abruptly looks up. Earlier he had said it was one of his three most exciting sounds. The sound symbolizes his hopes and dreams fading away forever. Noticing his travel brochures sticking out of his coat pocket, he discards them in disgust. Now that his brother is happily married, his sweet-natured mother (Beulah Bondi) tells George that local girl Mary Hatch has just returned to town after finishing college and he should call on her: "Nice girl, Mary......the kind that will help you find the answers George...she lights up like a firefly whenever you're around." Violet is scared off and amazed that he would ask her to do something so impossible and uncomfortable: "Walk in the grass in my bare feet? Why it's ten miles up to Mt. Bedford." She believes George is a bit crazy and the townspeople publicly ridicule him and laugh in amusement. He continues to wander through town and ends up half-intentionally passing by the front of Mary's house ("I just happened to be passing by."). After inviting him in from an upstairs window, and George mutters to himself: "I went for a walk, that's all," he finds himself in an uncomfortable encounter - conned into being an unwilling suitor by his match-making mother. (She had called earlier to alert her and announce his arrival.) Before he enters and joins her in the parlor, Mary has already changed into a lovely dress and fixed her hair. She has also prepared a nostalgic reunion for the two of them, recalling their walk together four years earlier and showing a romantic interest. She has remained true to her youthful vow whispered in the drug store. In the parlor, she prominently props up and displays a hand-sewn needlepoint portrait titled "George Lassos the Moon" depicting a cartoon figure throwing a cowboy's lasso around the moon and pulling it toward earth, and she plays a recording of "Buffalo Gals" on the phonograph player. He saunters disdainfully up the front walk as she waits at the door, expressing his reluctance: "I didn't tell anybody I was comin' over here, ya know." Unthinkingly, he asks why she didn't go back to New York with her friends: "I'd thought you'd go back to New York like Sam and Angie and the rest of 'em." To his consternation, she explains how she was "homesick" for Bedford Falls after working in New York for a few vacations. With a surly, rude, and belligerent attitude, he notices her portrait in the parlor and calls it "some joke, huh." Noticing that he is discontented about everything, Mary attempts to suggest a topic of conversation by bringing up an exploratory question on his feelings about marriage. Mary: Nice about your brother Harry and Ruth, isn't it? George (unemotionally): Oh yeah. Yeah, it's all right. George: Well, of course I like her. She's a peach. Mary: Oh, just marriage in general you're not enthusiastic about. George: No, no. Marriage is all right for Harry and Marty and Sam and you. 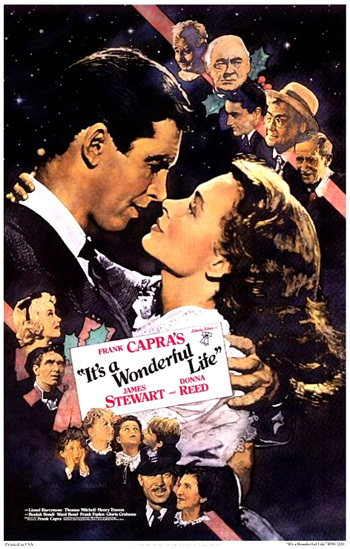 Mary's meddlesome mother interrupts their already-strained conversation ("George Bailey? What's he want?"). To aggravate her mother, Mary exaggerates what they're doing: "He's making violent love to me, mother." She encourages her daughter to send George on his way, because she expects a phone call from potential fiancee Sam Wainwright in New York. After arguing and yelling at each other, George storms off: "I don't know why I came here in the first place." Upset over their awkward encounter and faded dreams, Mary smashes the record of "Buffalo Gals." Exhausted after trying to be loving and patient with George, Mary answers the phone and speaks to Sam - with his familiar "Hee Haw" greeting. Because George has momentarily returned to retrieve his forgotten hat, she is able to let George know that mutual friend Sam is on the phone, making George slightly jealous. Sam asks Mary if he could speak to George Bailey - "an old friend." She disobeys her mother's wishes by sharing the phone with George. The phone conversation sequence has some of the most unforgettable moments of the film. They share the same earpiece extension, listening and talking on the same phone. Although the doorway to the parlor slices through the frame, symbolizing the distance between the two of them, they are squeezed together. George is very conscious of her being close to him, and resists his close proximity to her. He is romantically attracted and cannot deny that he loves her, but such an admission would mean remaining in Bedford Falls, where he has been forced to stay against his will and give up his other dreams. In a long closeup of them ear to ear, they listen to Sam who tells George: "Well, George Bailey-ofsky. Hey, a fine pal you are! What are you trying to do? Steal my girl?" Mary is unable to go to a different extension, because her mother listens in on the upstairs extension. Sam offers George a 'get-rich-quick' job in his new business ("it's gonna make us all rich"), telling him of the bright future in plastics. But Sam wonders if George is available, cheerfully mocking him: "I may have a job for you, that is, unless you're still married to that broken-down building and loan. Ha, ha, ha. It's the biggest thing since radio and I'm lettin' you in on the ground floor." All the while, George squirms and tries to contain himself, standing so close that he can smell Mary's hair. Then he runs out of words. She responds by crying helplessly, silently, and then George all of a sudden reverses himself and pulls Mary to himself in a fierce embrace: "I...I...Oh, Mary...Mary..." George overcomes his resistance to her and starts to kiss her, passionately, all over her face, holding her intensely. Their undeclared love for each other overwhelms both of them. Mary's mother turns from her eavesdropping on the stairway, running away shocked: "Oh dear, oh dear!" ...to shoot the works. A whole week in New York. A whole week in Bermuda. The highest hotels. The oldest champagne. The richest caviar. The hottest music, and the prettiest wife. The start of their honeymoon is dampened by rain - as they look through the rain-spattered rear taxi window, they notice "something funny going on over there at the bank." The worried townspeople race toward the town's bank and to the Building and Loan to withdraw all their funds - in a bank run that will threaten the town's financial security. Ernie is worried: "I've never really seen one, but that's got all the earmarks of being a run." Despite Mary's pleading with George to not interrupt their trip, George gets out of the taxi. Once again, George cannot leave his townspeople in a time of crisis. In the rain, he hurries to the Building and Loan. Echoing earlier shots in the film, Mary, in another expressively effective close-up, looks out the rain-streaked cab window as he dashes off. He finds the iron gate on the doors has been locked, creating a mob scene outside on the street. George unlocks the gate, unleashing the torrent of citizens into the association's lobby, where he finds Uncle Billy calming his nerves with a swig of alcohol. Billy proclaims in an agitated manner: "This is a pickle, George. This is a pickle." The crisis has obviously been fomented by Potter - the bank had called in their loan and Billy, in a panic, closed the loan company. Billy explains: "I handed over all our cash...Every cent of it and it was still less than we owed them." George is flabbergasted: "Holy Mackeral." They have very little cash left on hand to distribute to all the townspeople who demand to withdraw their money immediately. Meanwhile, Potter has already seized control of the bank during the crisis, and calls George to disingenuously help him: "George. I am going all out to help in this crisis. I have just guaranteed the bank sufficient funds to meet their needs. They will close up for a week and then re-open...I may lose a fortune but I am willing to guarantee your people too." Potter suggests that George tell the people "to bring their shares over here and I will pay 50 cents on the dollar." Faced with tremendous pressure and confusion, George looks at the portrait of his father and a motto on the wall for courage: "All you can take with you is that which you've given away." He realizes he must appeal to the crowd to allay their fears. If Potter gets ahold of this Building and Loan, there'll never be another decent house built in this town. He's already got charge of the bank. He's got the bus line. He got the department stores. And now he's after us. Why? Well, it's very simple. Because we're cutting in on his business, that's why. And because he wants to keep you living in his slums and paying the kind of rent he decides...Can't you understand what's happening here? Don't you see what's happening? Potter isn't selling. Potter's buying! Mary holds up the money that belongs to them, offering their $2,000 in honeymoon money to bolster the dwindling assets and satisfy the depositors, to tide them over until the bank reopens in a week. George sacrifices and throws away his last chance to leave Bedford Falls. The townspeople, although still fearful, trust in George's honesty and agree to withdraw only what they need to last the week. The fourth person in line meekly asks for $17.50. George leans over the counter and kisses the woman on the cheek, in gratitude. At the end of the day when the building and loan closes at 6 pm and they are left with only two dollars, George toasts the successful halt of the bank run: "A toast! A toast to Mama Dollar and to Papa Dollar, and if you want to keep this old Building and Loan in business, you better have a family real quick." George, Uncle Billy, Cousin Eustace (Charles Williams), and Cousin Tilly (Mary Treen) joyfully prance around the room, celebrating the survival of the Loan company. Forgetting that it is his honeymoon day, George receives an unexpected call from the newly-wed "Mrs. Bailey" and is informed that they have moved in at 320 Sycamore, the address of the old, abandoned and dilapidated Granville place where he had earlier resolved to Mary: "I'm shakin' the dust of this crummy little town off my feet." Outside in the rain, Bert is sorting through travel posters to provide decor and atmosphere for their honeymoon which must now be celebrated in town. His assistant asks: "What are they - ducks?" George is greeted at the door (with a sign "Bridal Suite") and ushered in, discovering that Mary has improvised an imaginative honeymoon composed of a romantic candlelight dinner in a house with a leaky ceiling and crumbling plaster. The outside of the windows have been plastered with travel posters to erase the reality that their trip to Bermuda was cancelled. The window posters advertise sunny Florida and Hawaii, and a South Seas poster hangs inside on the wall. Standing in front of the beautifully-set dining table, with a chicken rotating on a primitive spit in the fireplace (attached to a rotating gramophone playing Hawaiian music), Mary sweetly greets him: "Welcome home, Mr. Bailey." While they kiss, they are serenaded outdoors by Ernie and Bert. Emotionally sentimental, Mary thinks back to her secret, silent wish years earlier while they embrace: "Remember the night we broke the windows in this old house? This is what I wished for." Then, when Bert and Ernie have finished their song, Ernie kisses Bert on the forehead. Over the years, George has built a housing development named Bailey Park with "dozens of the prettiest little homes you ever saw. Ninety percent owned by suckers who used to pay rent to you. Your Potter's Field, Mr. Employer, is becoming just that." Potter is told how George's establishment threatens his own business, and he reacts with disgust: "The Bailey family's been a boil on my neck long enough." George's generosity toward the local townspeople makes prospects look dim and cash flow is low, but he is the best-liked man in town. In a contrasting scene, George compares his life to that of friend Sam Wainwright, a successful plastic business entrepreneur, who stops in town in his fancy car on his way to a sunny Florida vacation with his wife. Envious of Sam's success (wealth, glamour, and travel), George pauses with Mary as Sam drives away, jams his hands in his pockets, and then kicks shut the door of his own old car. I don't need 24 hours. I don't have to talk to anybody. I know right now, and the answer's no. No! Doggone it! You sit around here and you spin your little webs and you think the whole world revolves around you and your money! Well, it doesn't, Mr. Potter! In the, in the whole vast configuration of things, I'd say you were nothing but a scurvy little spider! George's words come back to haunt him in his memory, as he enters his bedroom where Mary is sleeping. He glances at Mary's needlepoint creation that hangs on the wall of their bedroom, and is once again flooded with intense memories of his failed, imaginative bravado. Shameful and full of self-reproach, he feels dismayed that he has never been able to take Mary traveling for adventure and romance like he had always promised. He had wanted to leave his small hometown and see the world, but instead presides over his family-owned building and loan, always struggling with his nose to the grindstone and never seeming to get ahead. He wonders why Mary has remained so loyal to him. She surprises him by hinting: "I want my baby to look like you!" Comically, she uses the metaphor of the needlepoint and announces that she is "on the nest" (pregnant and soon to 'Hatch' their first child) and that "George Bailey lassos Stork!" During World War II on the homefront, "Mary had two more babies, but still found time to run the USO." Sam Wainwright makes a fortune in plastic hoods for planes. Potter becomes head of the draft board. Mr. Gower and Uncle Billy sell war bonds. Ernie, Bert, and George's brother Harry go off to war. During the war effort, Harry is a navy fighter pilot whose heroics save a transport ship full of soldiers. George is rejected by the draft board as 4F due to his bad ear. On the homefront, he fights the "battle of Bedford Falls," acting as a whistle-blowing air raid warden (although he sputters into thin air when he forgets to put the whistle in his mouth). He also leads the paper and scrap-rubber drives. On Christmas Eve in 1945, Harry is awarded the Congressional Medal of Honor by the President at the White House. Harry's story is boldly displayed on the front page of the Bedford Falls newspaper: "PRESIDENT DECORATES HARRY BAILEY." That morning from Washington, Harry phones George in his office. Harry's family and friends in Bedford Falls plan for a home-coming to celebrate his native-son fame. George's partner Uncle Billy is in the bank about to deposit $8,000 in building and loan funds. Unfortunately, while gloating to Potter about Harry's bravery in the war, he absent-mindedly and unknowingly wraps the money in the newspaper he is holding, and passes it to Potter. In his office, Potter discovers the money and keeps it for himself - obsessed with the idea of owning the town and running the Baileys out of business. Potter silently watches from his office's cracked door as Billy frantically searches for the money. Returning to the loan company, Billy wildly searches through piles of papers in his office. At the same time, Violet has come to ask George for a loan to help her start her life over in New York. True to his generous nature, George assists her after which she tells him: "I'm glad I know you, George Bailey." Where's that money? Do you realize what this means? It means bankruptcy and scandal and prison. That's what it means. One of us is going to jail. Well, it's not gonna be me!